It’s been a while since we’ve written on specific terms in the sales world. So, we decided to dust off the old sales terminology category and start a series on key performance indicators (KPIs) specific to the world of cold email. First up on the list — Click Through Rate (CTR). I also hope to cover open rate, response rate, and cadence (more of a best practice more than a KPI, but fits). But CTR is first, because in my opinion, it stings the most. We send a batch of emails with the goal of getting people to engage with a resource or offer. When we do this only to have zero clicks it’s… frustrating. Most definitions you’ll see on the interweb will be for an on-page CTR. The explanation is similar, but we’ll have a go at putting out our own words for an email specific version. 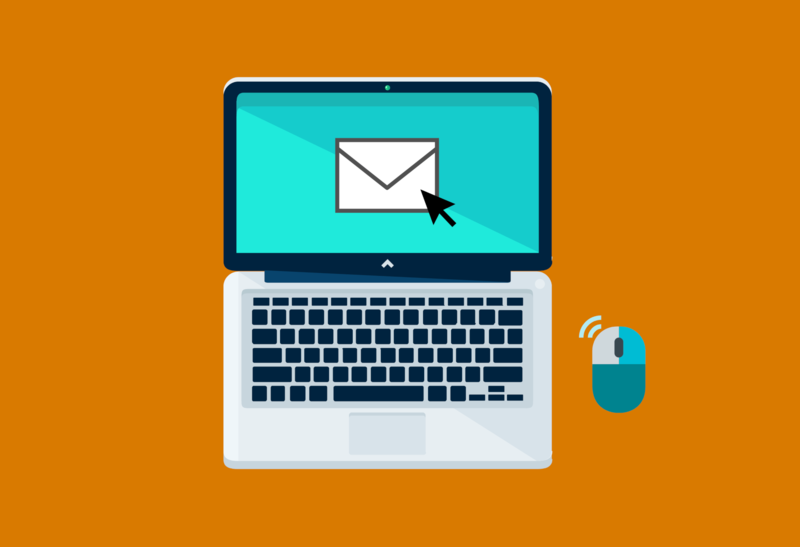 Email Click Through Rate: A percentage derived from the number of emails sent versus the number of recipients who click on the link sent within the message. Send 1000 emails and 50 people click on the link you included and you’ve got a 5% CTR. Pretty much everyone with a list is saying that the emails they send are getting fewer people to open, click, and respond. This is a big reason why I’m writing this series. The truth is that email is in an odd place right now. Just about anyone in the world has the capability to send thousands of emails with a couple of hours of learning and a computer. This has created a renaissance of sorts, but every influx of intelligence has its downsides. Spam is rampant (being blacklisted is easier), poor practices abound, and people are just getting turned off to any “offer” that they get in their inbox. But does this mean that cold email is a bad idea? No. Like the stock market, when everyone is saying “buy, buy, buy!” it’s better to hold off. When granny is about to put her savings into a company, I’d be bearish on it. That said, the opposite is true. When people are overwhelmingly negative, it’s time to buy. This advice is used by some of the top names in investing. People like Warren Buffet and Jim Cramer do this for their portfolios. Marketers do the same thing. Right now, people are killing it with direct mail. Why? Because “everyone” says it’s “dead”. Why Go on a Rant? Because people are saying that 2% is about as good of a CTR as you can get. And that’s just wrong. 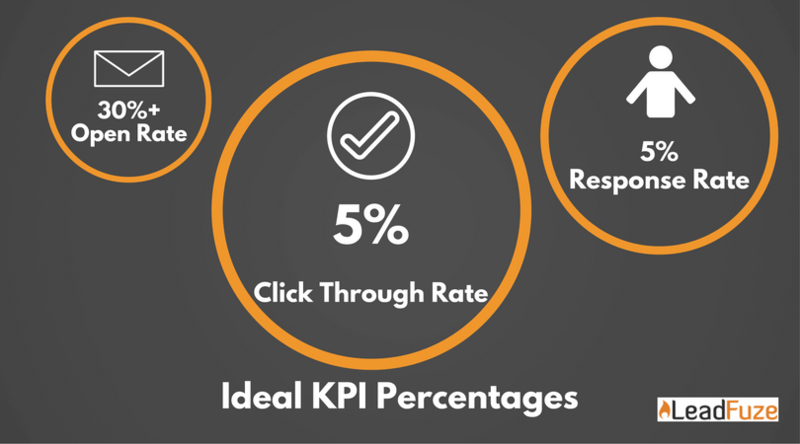 Our successful, prepared clients regularly see an average click through rate of 5%. When others are not seeing any progress, it’s because they aren’t using any sort of testing or best practices. Now, let’s look at the mistakes that will keep you from this number and the solutions to remedy them. Your goal with cold email is not, we repeat, is not to sell your products and services. Emailing leads is a fantastic way to gauge interest in topics related to your business and find qualified prospects. The end game of email is a conversation that (hopefully) leads to a sale. At LeadFuze we hope to end cold calls by providing tools and resources to businesses that get their target markets to respond to emails. This creates a “warm call” which is much easier to convert than a straight cold phone call. Here’s what most people think of when they see a cold email. Be honest, would you respond? Would you click any link in this email? Sidenote: There are some products that are worth a cold pitch, but by-and-large offering something to warm them up is a far better option. There are lots of things people wouldn’t mind seeing in their inbox. In fact, we’ve come up with 22 of them. If you’re a regular reader (or a client), you’ve probably seen them. But for those who haven’t, here’s a screenshot. So, why aren’t there more people using this tactic? Mostly laziness or unawareness. It takes time and effort to do most of these. You actually have to put together something worth reading or being a part of for it to work. B2B leads are often busy. Owners, execs, and professionals may be interested in a resource, but anything that makes taking a peek more difficult could thwart potential customers from clicking. Surprisingly, this includes having to scroll back up. Even short emails. Here’s one more link to the [resource name], [First Name]. Would love to hear your thoughts! One link that describes the resource and another, toward the end, that offers those one the fence an easy route to it. You may even want to put it in your P.S., if it’s not where you’re doing your CAN-SPAM verbiage. Remember that end goal? To get a response that leads to a conversation. To put a finer point on it, you are trying to get a micro “yes”. People know you’re trying to sell them something. This knowledge makes a direct pitch too risky for leads. But even with this in the back of their heads, a good offer and a clear CTA will help them say yes. If you include a smorgasbord of things leads can look at, download, or be a part of — you’re going to get a blanket “NO!”. Multiple links — good, links to multiple resources — bad. Obviously, the immediate solution would be to only link to one thing. But that’s not the full solution. You can actually have two different types of CTA, but both have to be related to the end goal. I put together a sample email (screenshot below) to illustrate what I mean. One to the actual show. If there are currently episodes, you’ll want to give them a link to make sure it’s “legit”. Not a link, but an invitation to reply to the email. Simple, yet the automated age has people skittish; wondering whether or not they can reply. Lastly, we have a link to Calendly. This is for those who are all-in and ready to talk to you about being a guest. Three different links, one purpose. Too many B2Bs forget about this one. Even an offer that isn’t your main offering isn’t enough to make up for poor written salesmanship. Too many consultants and owners can rock a call, but can’t translate that to solid copywriting. No shame, it’s a different world to sell with words. But don’t let that stop you. Here are several resources to help you improve your copy. Bonus Tip: Use good templates. 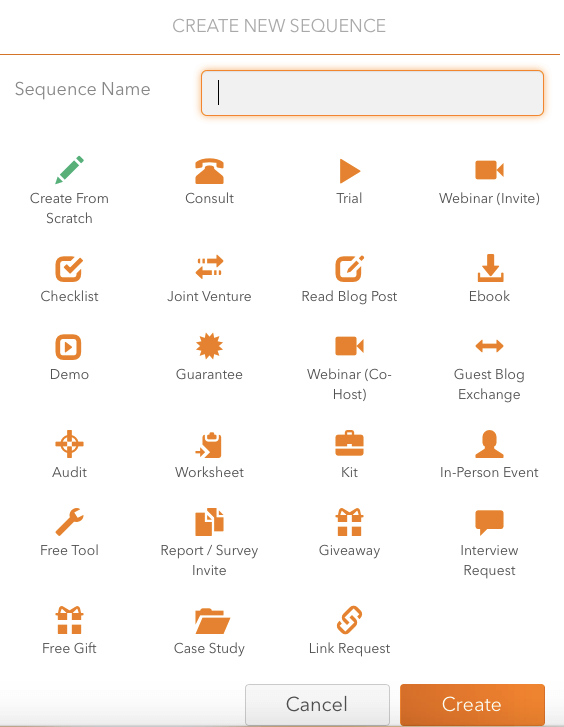 LeadFuze has template sequences for every one of the 22 sample offerings we’ve come up with. But there are great templates all over the web. Bonus Bonus Tip: Hire it out. 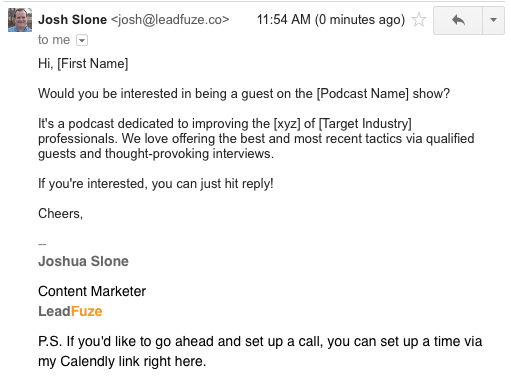 If you’re committed to gaining leads via cold email, it may be worth hiring a pro to give you a set of templates. I’ve had the privilege of writing some emails for businesses. Having a resource to give out is great. Only having one CTA is awesome. A super-focused goal is even better. And good copy is the feather that forces the finger to click. This last mistake comes after having a decent click through rate. Why include it? Because the ultimate goal isn’t clicks, it’s conversations. A bad resource is like getting someone to say, “That sounds good”. But when they actually take a look they quickly say, “What a joke!”. How does that equal sales? No secret formula here. Just hard work that pays off. It’s not only a solution for this mistake either, but you’re probably no stranger to a little hustle. You don’t have to start a podcast, write a novel, or change your business model. That said, you do have to think about who’s (hopefully) going to click on your offer. We’ve put together a resource about this very subject. You can read about it right here. These are the mistakes we see all the time and the solutions that have improved CTR in most of our clients who are actively trying to improve their messaging. But, there are undoubtedly things that work for you. We want to hear them! Let us know in the comments what mistakes you’ve corrected or experiments you’ve tried. Josh Slone thanks for the excellent article. I read your article with pleasure. In fact, when everyone switched to e-mail, it is very important that your letter is read by the recipient. I’m sure that everyone had a situation when after sending your letter you waited a long time while they answered it, and sometimes the answer never came. I like that you state your thoughts consistently, the article is well structured, readable and understandable to the person who first reads about it. This is an excellent quality of a person, when he can explain in an accessible language the information he owns himself. It is felt that you have experience writing articles and in the case that you lighten. All the best!